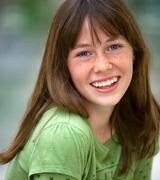 Barbizon Midwest Review: Breanna Podgorski of Barbizon Midwest is on FOX and the Big Screen! Breanna Podgorski of Barbizon Midwest is on FOX and the Big Screen! Breanna just taped a part in a new animated movie (and got her SAG card! ), called "Dorothy of Oz" starring Leah Michelle from Glee. Besides, Leah this movie has an all star line up: James Belushi, Dan Aykroyd, Hugh Dancy, Oliver Platt, Kelsey Grammer and Martine Short! Coming out in 2010, it's produced with state of the art graphics and the latest 3D techniques for animation-WOW! It doesn't stop for Breanna on the big screen, she has now written 15 original songs and is being seriously looked at by Hayden Pattinierre's music manager in NYC, Val Morris. Breanna will be producing 2 of her songs and then Val will evaluate the finished project! Keep your eyes peeled for Breanna!